The emergency care of ventral hernias is complex. The key to improved morbidity and mortality is operating on these patients prior to progressing to strangulation. The type of operation depends on many factors, including location of the hernia, patient’s physiology, imaging findings, and prior repairs with or without mesh. The operations can be open, laparoscopic, or a combination of both. The use of laparoscopy has a significant role in assessing bowel viability and repair. 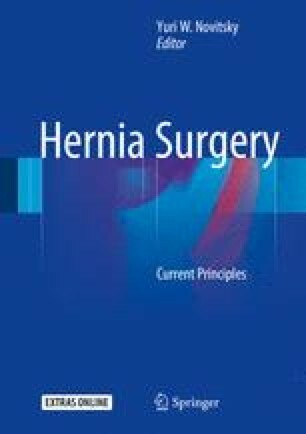 Dealing with large ventral hernias in a damage control surgery should focus on sepsis source control and abdominal closure. In these patients, definitive and complex abdominal wall closures with non-biologic prosthesis should be avoided. The goal is survival and planning a formal abdominal wall construction in the future with a non-biologic prosthesis. This chapter will review these topics.